By 1960 Placer High School grew in terms of physical space but reduced in population. The junior college had vacated its campus, moving to Rocklin as Sierra College, and two new high schools, Del Oro and Colfax, became part of the high school district. Placer High which began as a one-building facility in 1897 had an upper and lower campus comprised by 11 white stucco and red tiled buildings. More buildings would appear in the final three decades. By the end of the sixties the school boasted an on-site stadium for football and track, a new library, and new history and English wings which replaced the 1906 brick building. The 1926 science and auditorium wings were renovated by the seventies and a new practice gymnasium was built behind the venerable Earl Crabbe Gym in 1982. Students lived through highly interesting times, dancing the twist, the jerk, the swim, the watusi, and the monkey of the sixties, experiencing freedom from dress codes, and the protest of the seventies, along with some new traditions and legends. 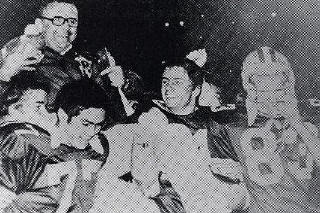 Homecoming became a colossal event beginning in 1967 when a five day celebration was declared, including a night rally, a bonfire, a Powder-Puff football game, and a dance, all a prelude to the big game against arch-rival Roseville. Senior pranks gained popularity, with one class, the Class of 1974 mounting 74 tires around the flag pole in the quad. New faculty faces moved in to replace legends of old and create legends of their own. Glenda Gonzales created a strong music program producing the first musical, Finian’s Rainbow, in 1965 and following it nearly every year with another Broadway hit. Her 1976 choir was honored as a Bi-centennial choir, and toured the nation’s capital. The Art Department under the guidance of Mario Ferrante, exhibited student work in an annual art shows for the school and the community. The student newspaper was revived under a new name, The Hillmen Messenger, several years after the demise of the Placer Union. The Vocational Industrial Club of America came into existence in the eighties, garnering several regional and state gold medals in competitions. Placer excelled in sports during this period of time as Tom Barry took over the helm adding to the heritage of the Crabbe and LeFebvre coached teams, and creating hid own glory. His teams won eight league titles in 12 years, including six in a row, at one point in the seventies, and he retired in 1979 averaging twenty wins per season. Bill Flake began a wrestling program at Placer in 1965. Before retiring, he coached his grapplers to seventeen league championships and guided two wrestlers, Steve Stratton and Gary Anderson, to state titles. Tom Johnson and Bill Miller teamed up as co-coaches to guide the Hillmen football program to its most successful era. From 1973 to 1982 they compiled a 93-18-1 record and five Sac-Joaquin Section titles. Three times they achieved undefeated seasons and twice they were ranked Number 1 in the state. Miller went on to coach the girls’ tennis and build a state powerhouse team that won 12 straight league championships and nine Sac-Joaquin Section titles. Radley McCord coached the boys’ tennis team to similar dominance. In the nineties, the Senior Project became a requirement for the students and the program paid off as student projects led to the Hall of Fame, an all-weather track, a Centennial Arch and brick walkway, and an art gallery among other projects. New educational concepts went into effect as well. The concept of Quality Schools became a reality with students given more responsibility to make decisions concerning their lives and education in a non-coercive environment. Finally, as Placer High School approached the end of its first century, the school applied for and received Charter School status, enabling the school to be run on independent state of education codes.